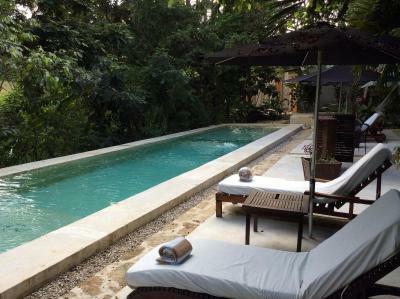 Lock in a great price for Piedra de Agua Palenque – rated 8.4 by recent guests! Amazing eco hotel located very close to the pyramids, offering a delicious breakfast and beautiful decor. My partner and I enjoyed a relaxing couples massage and had our beautiful tub awaiting us upon our return to our room. My expectations were truly exceeded! Absolutely amazing place, i highly recommend this beautiful hidden gem! One of the best hotels i've stayed in! Lovely staff, beautiful and confortable rooms, the swimming pool area was very enjoyable, very peacefull and relaxing hotel. Amazing value for money! The private outdoor bath tub was a bomb. So romantic and relaxing. Cozy, ultra comfortable, beautiful, beautiful, beautiful. Nature, styling of boutique hotel. Friendliness and kindess of staff. Ambiance. The atmosphere was tranquil. The staff was very helpful and amiable. My Spanish is not good, but they were very gentle with me and accommodating. Other guests were interesting and nice as well. The hotel is in a nice location close to the nationalpark and the town. The pool was absolutly amazing. Breakfast and service was also good. The hotel staff helpt us getting a taxi to agual azul. Room was nice, cosy and clean. Excellent location close to the park. Nicely designed rooms & comfortable bed. Staff was helpful and nice particularly as we were not 100% fit during the stay. I think we were also upgraded. Piedra de Agua Palenque This rating is a reflection of how the property compares to the industry standard when it comes to price, facilities and services available. It's based on a self-evaluation by the property. Use this rating to help choose your stay! Next to a river in the jungle, Piedra de Agua Palenque is 1.9 mi from Palenque Archaeological Site. The property has 24-hour reception and offers an outdoor pool and hot tub, free Wi-Fi and free parking. All rooms have a terrace and the suites feature pool views. Each room comes with a fan, seating area and wardrobe. The private bathroom comes with free toiletries. Breakfast is available at Piedra de Agua Palenque and there is a bar. Restaurants can be found 0.6 mi away, offering Mexican and international cuisine, such as Italian. An airport shuttle service is available for an extra charge. Yaxchilan Archaeological Site and Agua Azul Waterfalls are around an hour’s drive away. 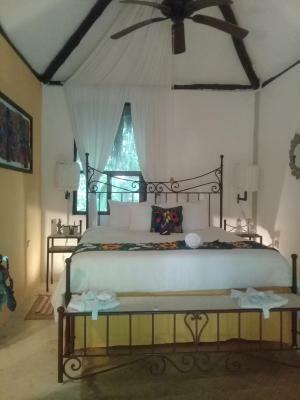 When would you like to stay at Piedra de Agua Palenque? House Rules Piedra de Agua Palenque takes special requests – add in the next step! Piedra de Agua Palenque accepts these cards and reserves the right to temporarily hold an amount prior to arrival. No private fridge and safe. Shows just a little tear and wear I would say. No eating options in the hotel, but good restaurants close by. Private outdoor bath nice, but water did not get really hot. Value for money is OK but not outstanding. We tried to contact the hotel a few days before arriving to try and and our booking but didn't receive a response. The breakfast wasn't very tasty. The hotel was lovely, surrounded by trees and the rooms was independent, so we weren't disturbed by noise. The room was lovely inside and it had an outdoor bath. The locally made shampoos, body washes etc. were a nice touch. The hotel was about halfway between the ruins and Palenque town. It didn't have a restaurant in site which meant we had to leave in order to have dinner. This was one of the nicest hotels we stayed in in Mexico. Truly exceptional service and beautiful concept with a respectful integration into the natural surroundings. Not enough personell. It seems that only one guy does everything there. He was very nice and helpful but he can't do the job for usually many different people. If the pool was maintained and cleaned a little more it would have been even niceer. But I guess in the jungle that's pretty hard. A little English would be great for the staff. They don't speak a word though which makes it hard for non Spanish speakers I guess. (We can speak a little and people where always very nice and tried to help). Beautiful location within the green lush jungle. It is very calm and silent there. No music no loud people or kids. Very relaxing. At times you can listen to the nature and animals in the trees. The bathtub on the Terrasse is amazing. We had a room at the very end so we where completely alone and out of sight. Nice for taking a bath and enjoying the sunset through the jungle leaves. Very comfortable bed. Huge and good and clean blankets. Also a very big ventilator over the bed made a great job in not needing to use the AC. Although there was one too. 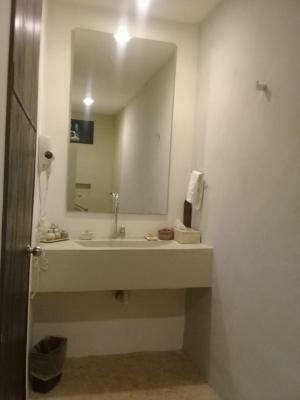 Bathroom is very large and has good facilities. Everything has small details in decoration wich is nice. They niceley clean and tidy the room every day. Nothing, would have loved to try a massage but they were a bit pricey unfortunately. Good location, nice grounds and pool. The whole staff couldn’t speak a word of English. I understand if there are some persons of staff that can’t express themselves in English but the whole staff was too much for a ***** hotel. The bed linen had lots of stains, so it didn’t look clean although everything was clean. 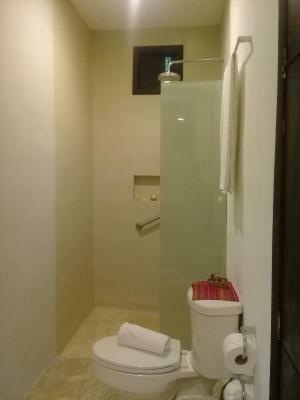 Nice location, perfectly between the center of Palenque and the archeological site. Great breakfast but three days in a row the same things. Very friendly staff, always ready to help. Big pool, very relaxing.